Euripides' father was Mnesarchus or Mnesarchides and his mother was Cleito. The family origin is disputed but they were sufficiently well off to ensure their son received a proper education. His interests included philosophy and science but he chose to spend much of his time alone. While many of his contemporaries were active in politics and other aspects of public life, Euripides' only foray into public affairs was an epitaph he wrote to commemorate the Athenians who died during a battle with Syracuse. In 454 B.C., Euripides was selected to perform his work at a drama festival. It was many years before he won first prize, an honor he would receive only four more times. As a writer of tragedy, he was not well respected by many of the comedic writers of the time and while his work was well known, it was not generally popular. 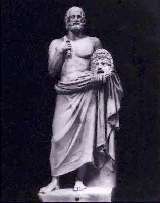 Aristophanes, a comic writer, went so far as to create a play that placed Euripides as the subject of many uncomplimentary jokes. Euripides' writing style was unconventional for the time. Dialogue in his plays employed everyday language and the religious and moral values he portrayed often diverged from the accepted thought of the day. His plays were often criticized for their unconventional structures employing extended prologues, disconnected discrete segments, and a chorus that seemed to be independent of the primary activity on stage. The conflict the plays presented was often found within the characters rather than in the more accepted manner between two or more characters. Euripides left Athens in 408 B.C. and was accepted into the court of King Archelaus of Macedonia. He died there two years later. It is estimated that he produced approximately ninety works, but only nineteen remain today.